Wheat is the staple food of North Indians. Its flour is used to prepare ‘chapAttis’, ‘pUris’, ‘parAthAs’ etc. South Indians make dosAs, pOLis, and appams from wheat apart from the aforesaid items. Wheat ground coarsely is cooked as rice and used as a rice substitute by diabetics. For this, you need a hard variety known as “chambA wheat” in the south, which is red, long and hard, from which wheat ‘ravA’ or ‘daliA’ as it is known in the north, is made. The milder varieties are meant for “AttA” or the wheat flour. We use daliA also for preparing wheat ‘uppumA’ whose preparation is akin to the uppumA prepared from sUji. AttA made from Punjab wheat is ideal for all the preparations. It has too less bran. Go for branded AttA from well known manufacturers. Local AttAs available in the market may not give good result. The AttA must be silky in texture and reject the coarse ones. The best test for the AttA you purchased is to check its texture by fingers whether it is very nice and soft (silky) and then sieve; if its flour content is less than the bran content reject it. When you sieve, use the sieve for flours with closed mesh. Even if you have good AttA, you may not get soft chapAttis or pUris as there are certain methods to be followed to achieve this. 1. Dough should not be too tight for ‘rOtis’ (chapAttis). It should feel very soft when touched. It is to be set aside for half an hour. For pUris, the dough can be tight but not hard. When you knead AttA, add a little oil and a pinch of salt and knead well. 2. Rolling is also very important. It should be moderately thin and even on all sides without any holes. If you roll thick then the softness cannot be achieved. Though you may not achieve perfect circle while rolling, make it in the shape of a circle or triangle in the case of rOti and pUris. In case you find it difficult for pUris, roll a large rOti and then crop circles using a circular lid of required size. 3. The flame should be hot enough to make the chapAttis or pUris to rise up. For chapAtti, first it is to be put on a moderately heated ‘tawA’ or the hot plate on which you heat the rolled chapAttis and when bubbles appear on its surface, it is placed on a rOti stand to be held over the hot flame. It will rise up quickly. Show both sides and you must not take more than a few seconds for this. Even if it didn’t rise up for any reason (say it was too thin or had some holes), it should not be kept for long on the flame since it will make the rOtis harder or char them. The tips given above are from my own experience. When I started making rOtis for the first time, I had a vague knowledge of doing it. So it did not come out well. I asked my mother the reason for it. She gave me the above tips and advised me to follow them. There are different varieties of dAls of which tUr dAl is widely used by the South Indians in their daily cooking because ‘sAmbAr’ and ‘rasam’ taste good only with this dAl. Maharashtrians prepare ‘varaN’, used as a side dish for rOti, from tUr dAl. When you buy prefer larger bright yellow grains. Also, check that the dAl is not small and oily dull yellow in colour as it may be kEsar dAl which is said to cause paralysis. Mung or green gram dAl and masUr dAl are used for making kUttu. I prepare sAmbAr and lemon rasam from green gram dAl also about which I will explain when we come to its recipe. Unlike tUr dAl, these dAls can be cooked directly without using pressure cooker. If soaked for 5 to 10 minutes, the cooking process becomes easier and quicker. Here also larger grains give better result. Black gram or urud dAl is the main item in dOsAs and idlis. Buy the full dAl instead of halved one, which we use for garnishing. New dAl is preferable as its batter will be fluffier, which is a must for dOsAs and idlis to give them softness. Ensure that the dAl is white and larger for idlis, dOsAs and jAngiris since the yellow colour shows old dAl which will not give good result. This is normally known as Bombay dAl. We make vadai, veLLai appam, jAngiri and snacks also from this dAl. In case you find the black skin removed full dAl not fluffy as I experienced in Kolkata, then you can go for the black skinned variety and remove the skin after the dAl is soaked in water and washed. Bengal gram or chanA dAl offers the major share in making ‘adai’ crisp, though other dAls are also added to prepare it. This dAl is an important ingredient for ‘Amai vadai’. Both Maharashtrians and South Indians make poLi from chanA dAl. When buying, ensure that the dAl is of bright yellow in colour and not very large as well as pale as it might be split from KAbUli chanA or dried yellow peas instead from small brown chick peas. The flour also will have bright yellow colour. 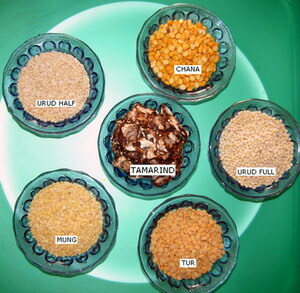 We use all the above DAls excepting mUng or masUr dAl in preparing various kinds of ‘podi’. Flour of chanA dAl known as chanA bEsan and urud dAl roasted and ground are essential in the preparation of south Indian snacks. Maharashtrians make a delicious item called ‘bEsan’ from chana dAl flour, which is very nice to eat after mixing with cooked rice as well as a side dish for chapAtti. Tamarind is an important item in South Indian cuisine. This is available either in packets or as a paste in bottles. Since tamarind is a seasonal product, some people procure this for the whole year. It is then dried in the sun for two days after removing its seeds. When it is cooled salt is mixed to store it in an air tight container to keep it safe from insects. However, by this way, in course of time, the tamarind becomes black and sAmbAr or rasam prepared from it will not be tasty and appear black. Further, the yield of pulp is reduced as the days pass by. I, therefore, prefer always fresh and new tamarind from the shop instead of the stored one. This is true in the case of all groceries as the stored ones for annual use always lose their value and the recipes made out of the old groceries do not taste well. New tamarind will be light brown in colour that reflects in sAmbAr and rasam. Vatral kuzhambu tastes better when made with old tamarind but not too old. Ready-made tamarind paste is not advisable for any recipes, especially for vatral kuzhambu as it tastes bad and bitter due to preservative added in it. If you prefer paste, then better make it at home and store. It renders better taste. Considerable quantity of tamarind for one week is to be taken and seeds, fibre strands, small stones and shell pieces, found if any, are removed. This is soaked for half an hour in piping hot water. After it becomes cold, grind into a fine paste and store in an airtight bottle to refrigerate. Do not prepare the paste for more than a week’s use and I advise its preparation on week end day. You can microwave also to heat the soaked tamarind for 2 to 4 minutes depending on the variety but every two minutes, check if it has become pliable and ready for making it a paste. Cooking oil is of various types, of which the popularly used one is sunflower oil. This oil is said to be harmless. However, I found it to be thicker and producing a sort of rubbery paste and sediments than the rice bran oil which is the best for health and is trouble free. In my opinion, any oil, which is thinner, producing no or less sediment and is triple refined is always better. That way, besides the rice bran oil, I suggest the usage of corn and cotton seed oil. Gingelly oil (also known as sesame or til oil) as well as coconut oil are also good along with triple refined ground nut oil. Bengalis and Biharis use mustard oil while coconut oil is used in Kerala. Pure and well refined gingelly oil is used for making pickles as it acts as a preservative and gives nice smell. It is also used when eating idlis and dosAs along with ‘miLagAippodi’. This entry was posted on February 8, 2011 at 7:24 pm and is filed under Introduction with tags atta, besan, chapatti, cooking oil, dAl, dosa, idli, podi, poli, puli, puri, rasam, rice, roti, sambar, tamarind, vadai, wheat. You can follow any responses to this entry through the RSS 2.0 feed. Both comments and pings are currently closed. nice tips for making roti amma.I have always been a very big fan of your soft rotis.I will try all the tips and certainly tell you how it came out. Thank you for your compliments! I will be glad to hear your experience on these tips! Please watch the next posting also!! Very nice topic amma. I really find the tip on Tamarind very useful… finding the new & old and which is good for what !!! Thank you for you appreciation! I am glad that the topic is found to be useful. Please watch for my next postings which will have all the general tips, even though I will also try to give tips against each recipe if necessary. I have added the image of masUr dAl also. Great article, ma! You have covered two main staple foods in your first two blogs!! Thank you! The next posting will be a long one and will have a lot of tips and, I am afraid, may stretch to at least three subsequent postings!! I am intending to start posting the recipes after this, starting sweetly with “Sarkaraippongal,” followed by other rice preparations.